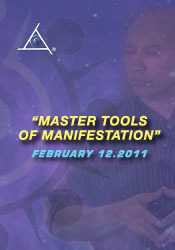 Bashar expresses clearly and concisely "the Master Tools of Manifestation" and how to use them to create your best life. Learn to master these powerful tools and bring about the dreams and changes in your reality that you most deeply desire. In following your passion , if you find issues and blocks coming up for you along the way, then there are ways to approach these challenges to get the best results. Bashar explains how to do this and what the experiences reveal about the theme you have chosen to explore for this lifetime. This powerful primer on manifestation will surprise you with it's simplicity and once applied, amaze you with it's effectiveness. Q&A: What are my life themes? Transforming darkness into light. How can I raise my vibration? How can I see beings from other dimensions in my dreams? Feeling like you are in limbo and having a positive attitude about the challenges you face. Overcoming roadblocks. The symbolism of Niburu and it's effect on our world. Discovering what is truly exciting for you and acting on it. Premonitions in childhood of impending earth crises. Feeling fear of dying and knowing when it is your time to die. The difference between God, the Higher Mind and the Oversoul. Why is there polarity and does darkness exist in every reality? How to break the chain of repetitive negative experiences. Why do some choose homosexuality? How does Bashar's civilization eat, sleep and procreate? When will we exist in a reality like theirs?